1. When you embark on a journey like this, its important to make sure you can keep chickens in your area. This is going to depend on state, county and city laws as well as, if you rent, landlord permission. Most counties will not let you own roosters, so make sure to check the specifics. There are also usually laws regarding where you place your coop on your property. Double and triple check! 2. You should draw up some plans. 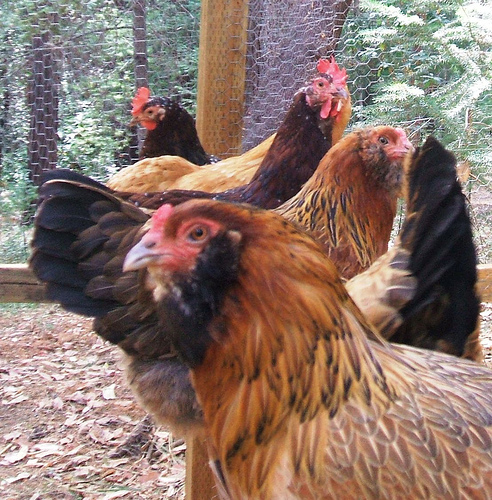 Do you want a mobile chicken coop – called a tractor – or one that is a permanent home? How many chickens do you plan on keeping and how big do you want the coop to be? What do you want to use for building materials? There are a lot of websites that have free plans for you to browse. One of the best is Backyard Chickens. They have a plethora of information about coops and chickens. For our own coop, we found a truck canopy at Goodwill for $30 that we used as the “base” (the roof) and built onto that. 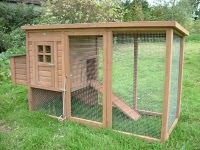 You could even search for “unique chicken coop images” and see all the different things others have made coops out of. 3. Next, build! Easy, right? We found some 2 X 4s and plywood and then screwed a wooden frame into the truck canopy so it was over six feet off the ground. Then, using the plywood, we built the actual henhouse under the canopy. The henhouse refers to the place where the chickens sleep at night and lay their eggs. We filled in any cracks with a foam insulate and covered the floor with a piece of linoleum for further draft protection and easy cleaning. 4. With the walls completed, we moved on to the safety of our chickens. The frame we set the canopy on is mostly 4 X 4s, very easy to staple gun chicken wire to. Make sure the chicken wire is taut and secure. Raccoons and other animals are very strong and tricky, and they want your chickens! coop before decoration? or leave it old school. 5. Finally… decorate! The chickens probably don’t care what it looks like, but you do! Paint, glitter, macaroni art that coop up! Ok, maybe not macaroni… But I definitely want to see pictures of your masterpieces! 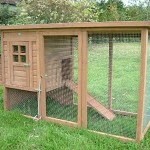 If you gather all the materials beforehand, you can kick out a quality chicken coop in one weekend. Don’t forget to have fun! This entry was posted in Do It Yourself, Saving Money, Ways To Be Green and tagged diy, recycle on July 22, 2011 by Jim McKenzie Smith. I’ve been using websites to find great free stuff for a while now, and it surprises me every time I talk with someone who doesn’t know about them. While some go out and spend $200 on a new dining set, I found mine for free – and it’s nicer looking! Generally you have to go pick it up, but sometimes they’ll be nice enough to deliver. What’s a few cents lost on gas when you get a free TV! You can even specify what you want by posting “Wanted” ads! Of course, it’s all local to whatever town, county, state, etc. you live in, just specify! When you’ve satisfied your “gimme gimme” craving, give back and free-recycle your unwanted but still in good condition (or not) stuff! This entry was posted in Saving Money and tagged free, recycle on June 14, 2010 by Jim McKenzie Smith. Everyone knows that we should carry reusable bags to the grocery store, but plastic grocery bags seem to pile up nonetheless. Who doesn’t have a kitchen drawer or cupboard exploding with bags? At Cash4Books, we encourage customers to re-use clean plastic bags as a packing material in their book shipments. The bags are then collected and recycled with EnviroFiber, a local recycling company. This had me wondering what happens to the plastic once it’s picked up? In doing a bit of research, I’ve found some surprises about the recyclability of plastic bags and other thin plastics. Although most home-pickup recyclers do not accept plastic bags (since they can get caught in and ruin machinery) many grocers now have collection containers destined for plastic recycling specialists. Melted plastic bags and sawdust can be combined to make composite lumber. This is actually the most common reuse for plastic bags. This new material is used to make door frames, outdoor decks, tables and benches. The composite of two recycled materials keeps trees in the ground and plastic out of the trash. Illinois based Chemist Vilas Ganpat Pol recently discovered a process to create carbon nanotubes from waste plastic. In this example of “up-cycling” (recycling waste into a more valuable product), plastic bags can ultimately be made into lithium-ion batteries. Really. 3. On your way to recycle used grocery bags? Include these too! According to the EPA, only 12% of used plastic bags were recycled in 2007. A recent survey revealed that 90% of Americans reuse their plastic shopping bags, mostly to replace garbage liners, lunch bags, and pet waste bags. The reuse of each plastic bag prevents a second bag from being purchased for a single purpose. The bottom line: should we try to keep plastic bags out of the waste stream (not to mention the “Great Pacific Garbage Patch”) by carrying reusable totes? Yes. Will we always remember to bring them shopping? Probably not. But we can recycle what accumulates, and the manufacturing industry is coming up with some pretty interesting ways to reuse the single use bag. This entry was posted in Ways To Be Green and tagged Cash4Books News & Updates, green, recycle on June 3, 2010 by Jim McKenzie Smith.